Norway is well known for its spectacular fjords and snow-topped mountains, but reaching the summit can be very hard work. However, once you succeed, you are rewarded with fantastic views, something that we should also strive for in sport and exercise medicine, by improving the care we offer to our athletes. The Via Ferrata may be optimal for some, while gentler routes will suit others, but we should not get stuck in the mud while we strive to reach our ultimate goal. 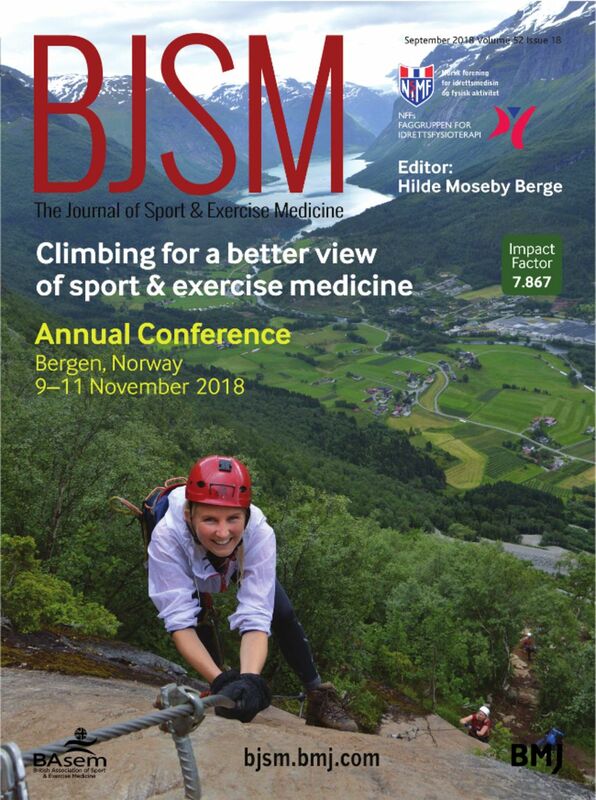 This issue of BJSM was assembled by the Norwegian Sports Medicine and Sports Physiotherapy communities; the 2018 Annual Meeting will be held in the Unesco World Heritage City of Bergen. One year ago, BJSM launched a new series of educational editorials (see page 1159), aimed at helping their readers to choose the best clinical pathways. The message was simply ‘methods matter’, as described in several papers in this issue. In Winters’ PhD Academy Award thesis (see page 1213), two physicians made the same diagnosis independent of each other, while applying the same decision protocol for medial tibial stress syndrome. In contrast, the systematic review (see page 1215) studying the effectiveness of physiotherapy, for pelvic and back pain after pregnancy, was unable to provide any conclusive answers, because all six studies used different methodology. Sticking with the theme of evidence-based medicine, the study of rehabilitation of patients following ACL reconstruction (see page 1199) showed a wide variety of outcomes, most likely because only 30% had used the recommended rehabilitation programme.1 Hopefully, the results would be much better if the study was repeated now, because the freely available rehabilitation programme1 has finally reached the 99th percentile and is placed in the top 5% of all research outputs ever tracked by Altmetric (score 734; 18 June 2018). In the future, I expect that all authors will also follow Griffin et al’s (see page 1160) advice for increasing the impact of their study. Concussion is presently a hot research topic, with numerous published studies in the literature. However, the best papers are still to come, according to Haider et al’s (see page 1179) systematic review of the criteria used to define recovery from sport-related concussion in youth athletes. The authors draw attention to the potential for bias in past studies, and the use of limited and different criteria. They recommend balance testing and baseline testing, tests that also are emphasised by the Medical Committee of the International Paralympic Committee (see page 1170) as especially important for the paraplegic or amputee athlete (see page 1211), and the latter also for athletes with communication difficulties or cognitive impairment. They suggest that the testing, and the advice given, needs to be carefully tailored for this group. It is therefore timely that Goosey-Tolfrey and colleagues (see page 1166) have created a nice infographic for the systematic review of patients with spinal cord injuries. They recommend at least 30 min of endurance training, three times a week, to obtain cardiometabolic health benefits in this group. These findings are in line with the theme of another infographic by Ekelund (see page 1164) that highlights the fact that physical activity reduces the risk of cardiovascular mortality caused by increased sitting time. The latter recommends 60–75 min of moderate-intensity physical activity per day, to eliminate the detrimental effects of 8 hours of inactivity/sitting time; something that is unavoidable for patients with spinal cord injuries in wheelchairs. One way to increase the physical activity options for individuals with disability is to make the environment more accessible. I was impressed to learn from the Inside Track (see page 1205) that Dr Babette Pluim cared so much for her disabled cats that she made her apartment accessible for them! The same effort is needed to increase physical activity in general, and Atherton and colleagues (see page 1168) give some practical advice as to how this can be achieved by redesigning the streets. Additional information could be obtained by the use of wearable devices that register which routes are used most commonly (see page 1158). However, increasing the general level of physical activity needs a much more active approach, because just wearing devices that track activity did not show any health benefits in a random sample of people, according to Thosar and colleagues (see page 1217). The need to carefully interpret different studies is highlighted in Conroy and colleagues’ editorial (see page 1158) that establishes a connection between increased physical activity and an increase in the use of alcohol. Adults reported that on days when they engaged in more physical activity than usual, they consumed more alcohol than usual. The level at which the benefits of physical activity are finally outweighed by the health risks is a recurring question that was addressed in our Warm Up 3 years ago. In this issue, Magavern and colleagues (see page 1207) reflect on the ethical implications of disqualifying athletes with cardiac conditions that potentially increase their risk of sudden cardiac arrest during sport. Less life threatening, though with important implications for quality of life, is the challenge we face when advising athletes which activity level to return to after ACL reconstruction. Fortunately, these decisions will be easier with the publication of a Norwegian study (see page 1199) that reviewed the incidence of arthrosis in a 15-year follow-up of patients who returned to pivoting sports. That brings us to three final clinical papers. The 2018 consensus statement (see page 1170) on exercise therapy and physical interventions to treat patellofemoral pain, Haugsbø and colleagues’ (see page 1170) paper on overuse injuries in the shoulder and, finally, the use of new techniques to monitor exercise-induced bronchial obstruction (see page 1191) in everyday life, namely the use of a mobile phone and selfie videos. These remind us that medicine is constantly changing and that integrating the latest research into our daily clinical practice is essential if we are to improve patient care. In April I attended the 27th American Medical Society for Sports Medicine’s (AMSSM) Annual Meeting as an international travelling fellow. A big ‘thank you’ to everyone who made my trip so memorable by sharing your time, experiences and meals with me. I also thank all my colleagues in Scandinavia who warmly welcomed the AMSSM’s visiting fellows when they ventured here earlier in 2018. Spending time together opens our eyes to ways that we can improve our practice in sport and exercise medicine and we will continue our collaboration by organising a meeting during the Scandinavian Congress of Medicine and Science in Sports in Copenhagen in January 2019 (https://10times.com/scmss-bh). We are planning how best to climb together, reach the summit and enjoy the view so you are all welcome to join us! And if you can’t wait, please attend this year’s Norwegian Congress in Sport and Exercise Medicine (https://www.imhk2018.com) which is being held in Norway’s World Heritage Fjord City—Bergen—on 9–11 November.